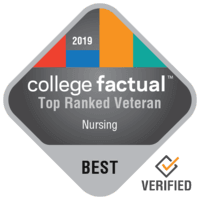 Fairfax, Virginia – College Factual released its 2019 national and state rankings for Best Nursing Programs for Veterans. George Mason University performed very well in these rankings. GMU’s Nursing program is ranked #31 out of 523 for veteran friendliness of all colleges and universities reviewed by College Factual. This puts GMU in the top 10% of all schools in the nation when it comes to offering a quality education to veterans studying Nursing. See the full ranking of Nursing programs for veterans. George Mason University’s Nursing program is ranked #1 out of 11 colleges and universities in Virginia reviewed by College Factual for veteran friendliness. This means GMU is the best school in Virginia for veterans studying Nursing. GMU has achieved this ranking 2 years in a row. See the full ranking of Best for Vets Nursing programs in Virginia. Based upon PayScale survey data*, a student who graduates from GMU with a degree in Nursing realizes average early-career earnings of $57,588 and average mid-career earnings of $77,172. This is above the national average for all Nursing graduates who make $53,330 in their early career. It is also higher the average graduate’s mid-career salary of $70,078. Learn more about majoring in Nursing at GMU. George Mason University is located in a suburban setting, serving approximately 23,800 undergraduate students. Roughly 2,190 of these students are GI Bill® recipients. See all the ways that GMU is supporting veterans. Get notified when similar news about George Mason University happens.